We live in a middle class suburban neighborhood in Southern California. One peculiar thing that I have noticed amongst our neighbors is that most of them park their cars on their driveways or on the street. By my personal and very informal observation, I would estimate that 75-80% of my neighbors park at least one car on the driveway. I would estimate that 30-40% of my neighbors don’t park any vehicle in the garage. Oops, did I just post a picture of your garage? I’m sure my little sample size of ~50 homes is a representation of what most middle class income earners do with their money: buy and accumulate crap. I took these pictures off a google image search; I'm not about to walk up to my neighbors' garages and take pictures! I’m sure at one point some of this stuff was shiny and fancy: a new desktop computer, some new furniture, a nice bookshelf, record player, fish tank, lawn chairs, old weights, old VHS tapes, old Christmas tree, unused animal kennel, unused treadmill with piles of storage boxes on it, etc (really, this is the stuff we see). Now all this stuff just looks like garbage, piling up in the landfill that used to be a garage. If this was what their garages look like, I wonder what the inside of their homes look like. I imagine old books and DVD collections gathering dust on bookshelf. I imagine other stuff lying around that is broken, losing value, and taking up excessive space. There’s no more room for any of this stuff in their homes and closets and now it goes to fill up the garage. If you can’t park your own car in your own garage, you have a problem. If you have to rent out a space at a storage facility for all of your crap, you have a bigger problem. I was surprised to hear that some neighbors really do this. Kind of ironic that the average US household credit card debt is $15,325 and yet people continue to hoard and accumulate what eventually ends up as a stockpile of garbage in the garage. The shiny and nice things people strive to buy (thinking it will make them happy) end up locking them into debt. People can’t move anywhere without dragging all their stuff with them, most of which is stuff they’ll likely never use. This has caused us to take a good look at all the crap that we have. We’ve always strived not to accumulate crap, but we’ve been tricked in the past at gift shops into picking up random knick knacks as souvenirs. I pretty much regret all of those purchases. They sit on the shelves just gathering dust and taking up space. Luckily we have never been interested in collecting books or DVDs, although we do have a few books and DVDs here and there. Today I will talk about a simple 3 step way to declutter the place you live in. How much money has all this stuff cost you? And how much happiness has this stuff brought you? How much of your stuff are you putting to good use? Are you really re-watching your entire DVD collection or can you just find what you want to watch on Amazon Instant Video and stream it to your television for a few dollars? Are you really re-reading your book collection or can you just go borrow the same book at the library? Now is the time to take a look at this stuff and decide what to keep. If you haven’t had any use for something over the last 12 months, you likely will never use it. Try to see if you can sell some of this junk. If not - it’s time to donate it, give it away as gifts, or throw it in the trash. This step won’t be easy for many of you. Many of you may have developed emotional or sentimental attachments to your stuff, especially if you’ve had it for a very long time. Start by getting rid the absolute most useless junk you own. Note how it makes you feel to finally put this garbage in the trash. Appreciate how much space you just freed up. Once you get past your initial reluctance to get rid of some of your useless junk, it will get easier and easier to continue the process. Start with getting rid of just one item of junk each day. You will feel more and more free with each item you let go. Then you can work on getting rid of more crap. Pretty soon you’ll know exactly which stuff is worth keeping, and which stuff has absolutely no positive impact on your life. Whenever you get tempted to buy new things, ask yourself a few questions. Is this really stuff that you need? Is your life functioning just fine without this new item? Will this stuff only give you temporary happiness or will it give you true permanent lifelong happiness? If you have any credit card debt, can you truly afford what you are buying? Is this item going to just collect dust on the shelf? You can play with a compounding interest calculator like the one found on moneychimp.com to see how much money you could be earning if you were to invest money instead of spend money. For example: let’s say you’re thinking about buying a new laptop for $1,200. Your current laptop is working just fine but you want something slimmer, lighter, and faster. You want the new 13" Macbook Air. You could spend $1,200 now to own the laptop, or you could invest that $1,200 and your money could be worth $2,360 in 10 years. Buying a new laptop on credit can be even worse. If you buy a $1,200 laptop on a credit card with an interest rate of 18% and make only the minimum payments, it would take over 10 years to pay off the laptop, and you would have paid $1223 worth of interest payments for a total of $2,423. For this example I used the credit card calculator on Bankrate.com. More and more we are beginning to see that true happiness is not related to what we own, but simply having a positive outlook on feeling content with what we already have. It’s really quite liberating to be able to de-clutter your life, trash the junk, and make sure no new junk ends up in your closet or garage. Pretty soon you will realize that owning less actually provides more. You’ll have less crap to organize, clean, or repair. You’ll have less debt, and more money. You’ll have more space in your closet and garage. When you learn to stop buying crap, you will be on your way to achieve the riches of financial freedom. Another positive change that I’m also noticing more recently: a lot more garage sales. Maybe my neighbors are learning from their mistakes and finally trying to get rid of their crap? Hopefully it isn’t to make room for new junk. If you want to accumulate something, how about trying to accumulate more wealth? I see a little bit of junk building up off to the side. Suddenly, I have the urge to get rid of some of it. I have taken to selling old items on Amazon. Clearing out clutter and padding my savings account? Yes, please! 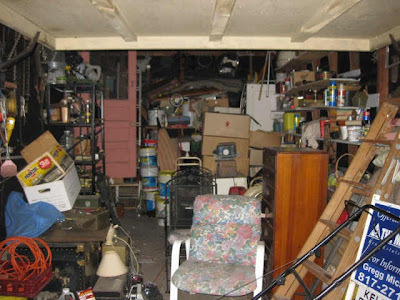 Getting rid of old junk in your house is absolutely essential. I needed to get public storage in santa monica, and i was very glad I did. I was even able to clear out enough junk so i could stage, and sell my house. Thanks for the post. The irony of this "comment / business promotion" is that I don't in any way encourage anybody to store their crap in a public storage facility. It is both a waste of space and money. Decluttering does not mean pack all of your junk away in a paid-for storage facility. This is a great post! Something that everyone needs to hear. Keep it up! Ohhh...That's really looks ugly as everything is clutter out. Really decluttering is very important and the tips you have shared for maintaining stuff really great and helpful. Thanks for making such informative post. Everyone wish to get a beautiful home. 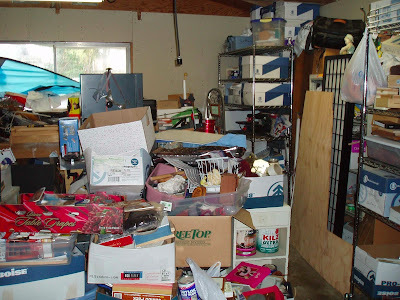 De-cluttering can increase the value of your home. Every process for home decoration starts from DE-cluttering. When you written the 2nd para I thought that after that parking car stuff you have directly shown the garage that is being used for the storage purpose. I got lost in the irony you have created here. Quite awesome tips and really helpful as well. my friends have this same problem. . .